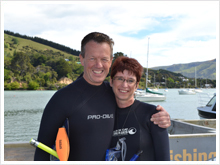 A better quality of life, good work life balance and the opportunity to pursue our love of the outdoors in a beautiful country was our motivation for moving to New Zealand – a journey that began at the start of 2012. After visiting the down under live show in Birmingham, we had had lots of information and practical advice on the steps we needed to take on what was to be a rollercoaster ride over the next 15months. I first had to register with the New Zealand Council of Nursing, which included sitting English exams, this gave us enough points to apply for our permanent residency visa without first having a job offer. Over the next few months whilst this was happening we made plans for a trip to New Zealand in November, this coincided with lodging our visa application – as well as the Spring weather. We wanted to be sure this was the right move for us as we intended it to be a permanent one. Although too early to apply for jobs – we had given ourselves a timescale of spring 2013 to move – I was keen to get a feel for the hospital environment. Having already registered with Tonix Health Recruitment agency from our visit to the Down Under show, I had chatted at length to Kate who was able to arrange some hospital visits during our holiday time. Meeting Kate in person in Christchurch enabled her to get to know me better, and discuss my options. This was really important when it came to the job search as she was better able to match me to job vacancies. Visiting some hospitals also gave me the opportunity to ask lots of questions and better prepared me for job interviews that were to come at a later stage. Although we only spent two weeks in New Zealand we fell in love with the Country and the way of life. The people we met were fantastic, and we spent our time both sightseeing and researching the way of life, cost of living etc. When we returned to the UK we were even more sure of our decision, and keen to complete the process. Our application had been selected from the pool whilst we were away, so we had quite a few things to complete and information to gather for submission. We were frustrated at the length of time it would take for processing (6-9 months without a job offer) so as well as putting our house on the market I started applying for jobs with the help of Tonix. My job as a Matron in England was incredibly stressful and I was keen to get back to hands on nursing – with 23 years experience and good references I thought this would be fairly straightforward to get a job as a staff nurse. Interview one (from my Kitchen via skype!) for a staff nurse post at a small hospital was unsuccessful – I was gutted. They took a “local” candidate. The next interview was successful and I was offered a job in the ICU at a private hospital in Wellington. This speeded up the visa process, but the pressure was on for everything to be completed in order for us to move in 9 weeks time (we had planned to move 2 weeks before I started work to allow time to get over the long flight and settle into our new surroundings). This was an incredibly stressful time as although we had done a lot of planning there were many things that could not be done until we had this actual date and we still hadn’t sold the house. Being organised was key, as the last few weeks were very hectic – the visas were not going to be processed in time so we also had to apply for a work visa in order to be able to fly out and start my job. The time flew buy, and the house sale completed on the day the container was packed and leaving (it takes 9-12 weeks before seeing it again). We stayed with friends and family for the last week in the UK, and this was a very emotional time with so many goodbyes. By the time we got on the plane for the 30 hour journey we were exhausted. We arrived in Wellington on the 29th April and booked into our Motel – we had a three week booking to give us time to have a look around and find somewhere to rent. We were so happy to be here. We spent the first two weeks looking around, finding a car to buy, somewhere to rent, some basic supplies to tide us over until our stuff arrived as it was still going to be a few weeks. Another busy time, and we were so glad we had allowed time for this before starting work. We had planned our budget carefully and allowed time for Tony to find work, his support in the early days was so important for me whilst settling into my new job, but he quickly found work. We are now enjoying our new life here in Wellington, with quality time to explore our new surroundings and make new friends whilst still keeping in touch with all our family and friends in the UK.